Simple to use, EVIDAS software features an intuitive user interface that provides immediate visual feedback. By simply connecting the smart sensors (TEDS), it takes two simple clicks to display measurement results, without any programming, saving users valuable set-up time and effort, which is a considerable benefit for those on the move. In addition to TEDS and the sensor database, EVIDAS software also provides two innovative configuration options; a convenient dialog for configuring individual channels and direct configuration in the channel table. Complete with its own cloud integration for global data access, data can be conveniently stored, exported and used for review in all common formats from anywhere in the world. Developed to suit a variety of applications, typical function areas of EVIDAS software include data acquisition in test bench and laboratory applications, as well as component testing. Available in a range of packages, the Cloud Basic Package includes 5 GB of memory space. Featuring a user interface, that is available in English, German, French, Chinese and Japanese, the new EVIDAS software is a flexible solution which meets the requirements of each individual application. For more information join the latest HBM webinar titled, EVIDAS  with 3 Clicks from the Measured Value to the Cloud on Friday 15th June 2018, which follows the road of the sensor to the cloud and discusses how the traditional sensor amplifier software measuring chain is being revolutionised by HBMs very latest data acquisition software, EVIDAS. In this webinar, participants can learn how to acquire measurement values quickly and efficiently and also how to efficiently share data worldwide through the cloud. Designed to fit in with challenging time constraints which can often make attending relevant training courses difficult, this webinar takes a maximum of 30 minutes and can be easily accessed at a later date or simply used as a refresher course. As an added benefit, all registered participants will receive a link to the webinar, via email, after the presentation. All HBM webinars are free of charge. However, spaces are limited and are available on a first come, first served basis. 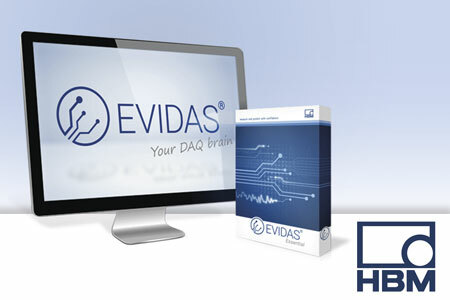 To find out how EVIDAS can work for you download the latest data acquisition software, EVIDAS Essential, or have a free trial of all functions for 30 days by visiting here.